The dream of every child is to play football with their idols. And Beko, Premium Partner of FC Barcelona, has managed to make that dream a reality for a group of beneficiaries of the 'FutbolNet' project of the FCB Foundation, from the Besòs neighbourhood of the city. Before last season ended, a day set up by the Foundation invited the beneficiaries of its project to a special session in a special place. All of the kids boarded a bus and reached the Ciutat Esportiva. It was a day of coexistence in which they were able to work with the values of the project in an unmatchable environment. But the day was just about to get better as, just before the end of the session, Leo Messi, Gerard Pique and Arda Turan entered the pavilion to surprise the youngsters, who were in awe of who just walked through the door. The first team players exchanged impressions with them and had a great time together. This story resulted in a video produced by Beko called ‘The chance to play’, which shows that dreams can come true. While the students of the Institut Barri Besòs de Barcelona (Besòs Neighbourhood Institute of Barcelona) had to pinched themselves to realize if what was happening was real, Beko converted an old space of the school into a kitchen with new furniture and appliances, an area where students can also learn and play. 'FutbolNet' is a pedagogical methodology that aims to educate children and young people through the promotion of positive values that come from sport. The project focuses on five values marked as essential for personal development, which are discussed before, during and after the game: effort, respect, teamwork, humility and ambition. The instructors oversee the game without criticising and instead encourage dialogue among all participants to assess and analyse the positive and the negative side of their attitudes in order to improve them and off the field. The project currently reaches 100,000 beneficiaries around the world and has been applied to Catalonia, Argentina, Brazil, Mexico, Oman, Saudi Arabia, Iraq, Qatar and some 40 African nations. "Everybody deserves time to play in life, but for some people it is not always possible. For the children of this school, football and the club is everything to them, so Beko allied with the Club to give them the opportunity to live a dream day at the Ciutat Esportiva and Leo Messi, Gerard Piqué and the Arda Turan came to give them a surprise. Also we wanted to leave our legacy on the school by redesigning a new workspace with Beko appliances." “We are delighted to work with Beko, a company which believes in the same values as us. Barça is an institution committed to the social sphere. The Foundation develops its own educational programme of values through sport in over 51 countries worldwide. FutbolNet is one of its main programs, a joint initiative aimed at preventing violence, promoting gender equality and the integration of people with disabilities, established as a tool of great impact." 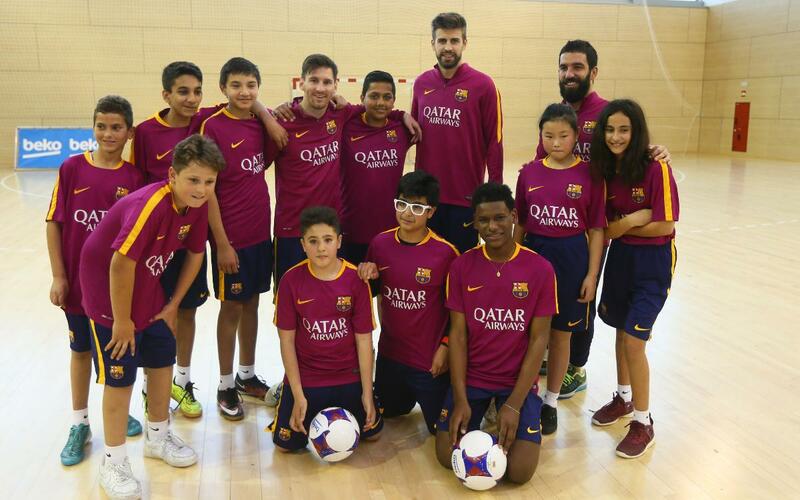 "Thanks to Beko and FC Barcelona, these young people have the opportunity to play in a space hard to imagine. This gives them an opportunity; it is something that makes them happy. During the event, I saw them as they approached the players and none of the children could believe it, it was spectacular. The surprise in their faces. It was a gift."